Can you believe we’re already half way through July? It just seems insane, but it’s okay because that means it’s time for the lovely Jessica from A Happy Food Dance to share a recipe with all of you! And let me tell you, this one does not disappoint! Matt and I were just saying this past weekend how it was about time we made a pulled pork, well now we’ve got three awesome recipes to make with it! I’m so excited to have Jessica here every month and absolutely adore her blog and I know all of you will too! Enjoy the delicious breakfast (or dinner) she’s whipped up for us today and don’t forget to follow her on social media! Hi, guys! So happy to be guest posting on Living Better Together – Rebecca has some amazing recipes on her blog, total swoon worthy, and I’m so glad to be here the third Wednesday of every month sharing my recipes. I’m Jessica – the main margarita drinker and cupcake eater over at A Happy Food Dance. I live by the beach in Southern California and my blog is a reflection of my lifestyle and environment. I love light and casual fare, with decadent desserts and a good drink mixed in between. 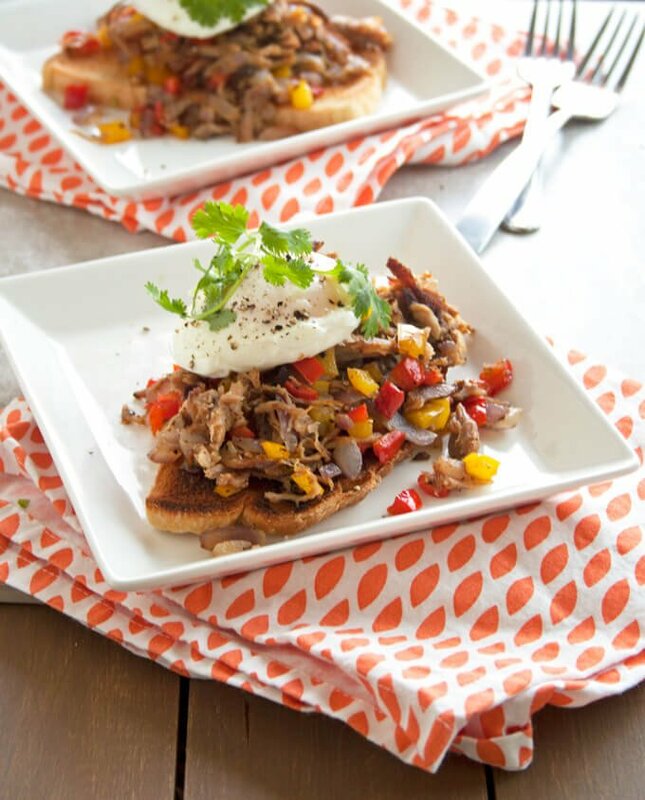 Today I am sharing with you my Pulled Pork Breakfast Hash! I make this recipe so often because who doesn’t like pulled pork anything and this is the same pork I use in my Crockpot Pulled Pork Sliders. In addition to blogging, I work a full-time job designing stores for a well-known clothing company – long hours and a 60-minute commute (each way) don’t always leave me a lot of time for cooking dinner- but this pulled pork is so easy! Simply rub it down with seasoning the night before and then the next morning throw it in the crockpot and let that baby do the magic! You come home to the most intoxicating smell and a super easy and delicious dinner which makes tons of leftovers. So what do you do?!?! I make these Pulled Pork Cookie Sheet Nachos and this breakfast hash – all.the.time. Simply toss your favorite veggies in a skillet and let them get all soft and delicious. I use a red pepper, yellow pepper, and red onion, but you could easily throw in your favs. Once they have become soft and have started to brown on the edges, just toss in your pulled pork. It simply needs to get warm and voila! 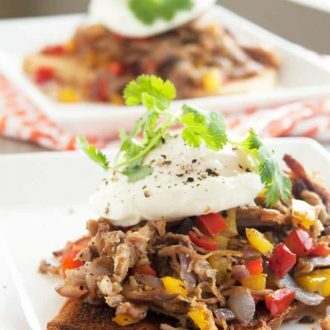 – pulled pork hash. Toast some bread and cook an egg (any style – I poached mine because I love that delicious runny yolk) and you’re done. Seriously, such an easy breakfast! And now you have three easy meals made from one crockpot pulled pork recipe. In a large skillet, melt the butter and then add the red pepper, yellow pepper, and red onion. Cook until vegetables are soft and edges begin to brown. While your vegetables are cooking, toast your bread and cook your eggs (you can cook your eggs any style - I pouched mine). When the vegetables are soft and just starting to brown seasoning with salt and pepper and add the pulled pork. Cook just until the pulled pork has warmed throughout. 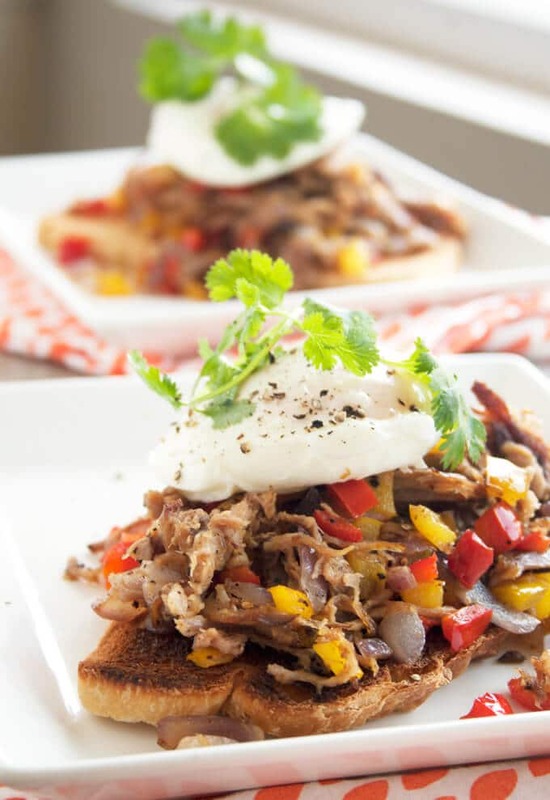 To plate, add a big scoop of the pulled pork atop the toasted bread and then add your eggs. Garnish with cilantro if desired and season more if necessary.